The Truck Factory has been successfully fulfilling truck repair and Truck towing needs for 30 years! The Truck Factory is pleased to boast more than 30 years of knowledge and experience with heavy vehicles. 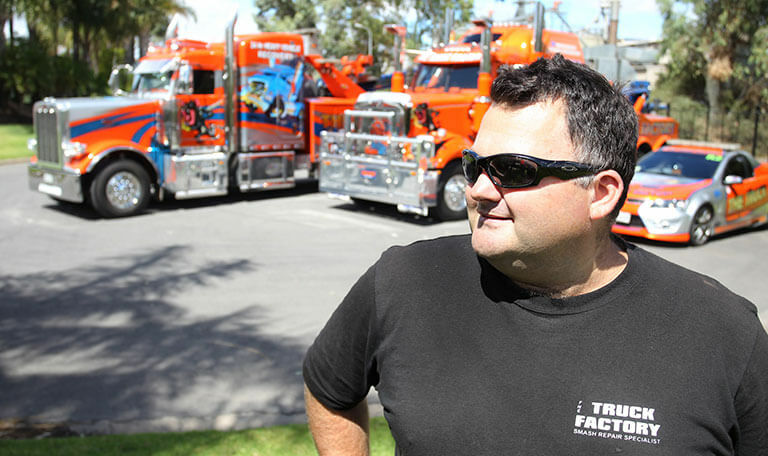 Founded by Tasmanian-born Mark Menzie in 1986, our family-owned local business has successfully dealt with all kinds of heavy vehicles and crash repairs, cementing our position as one of South Australia’s most trusted towing and recovery services. Mark’s journey with vehicles began at the age of 15, when he left school to work in a crash-repair shop, and as soon as he was old enough, qualify for a tow truck license and move into the heavy-vehicle recovery industry. It’s the years of hands-on experience and expertise he’s since gained that set the foundations for the premium business we run today. After arriving in Adelaide, Mark slowly became a favourite and reliable face on the truck and automotive repairs scene, and naturally built up a strong base of dedicated customers who still rely on him to get them back on the road today. After the suggestion from one loyal customer to start his own crash and repair business, The Truck Factory was born in a modest Wingfield shed. The three-man team soon outgrew its humble beginnings and moved to its current home at Angle Vale Crescent, where it emerged into the 24-hour industry pillar it is today. A variety of tow trucks were added to the family between 2010 and 2016, including the legendary Kent Construction 389 Peterbilt, the Freightliner and the Western Star. With its sister company, Adelaide Big Tow, operating by its side, The Truck Factory today is a full-service facility for heavy and commercial vehicles, with the finest selection of equipment and machinery to get the job done quickly and efficiently. Find us at Lot 6, Angle Vale Crescent in Burton, South Australia.